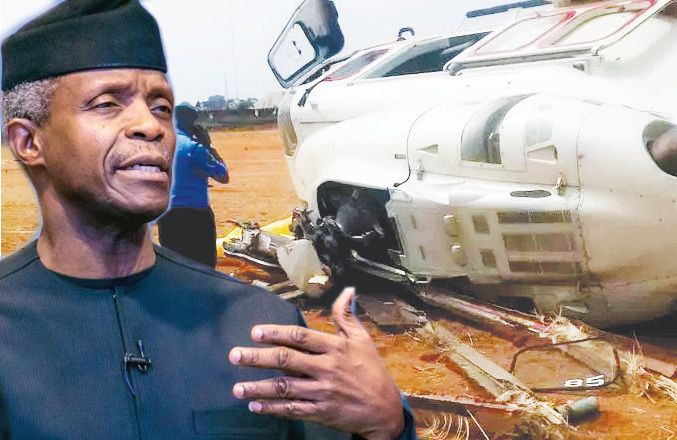 Vice President Yemi Osinbajo has said God’s mercy and the special prayer of protection that the General Overseer of the Redeemed Christian Church of God, Pastor Enoch Adeboye, prayed for him last Friday were responsible for his escape in the helicopter crash. Osinbajo said he believed that God and Adeboye’s prayers were responsible for his escape last Saturday. He urged the members of the congregation to believe in the efficacy of prayers. Dignitaries who attended the thanksgiving service included the Speaker, Kogi House of Assembly, Matthew Kolawole; Secretary to the Kogi State Government, Dr Ayoade Arike; Special Adviser to the Governor on Security, Jerry Omodara; commissioners and Senator Smart Adeyemi. In Lagos, Adeboye led the congregation at the headquarters of the church at Ebute Metta, Lagos to thank God for saving Osinbajo in a helicopter crash on Saturday. He asked the congregation to give glory to God for saving Osinbajo’s life. According to Adeboye, the devil wanted to take Osinbajo’s life but God put the devil to shame. He, therefore, asked the congregation to specially appreciate God on behalf of the Vice-President and all those onboard the ill-fated helicopter, for his supernatural protection, saying Nigeria would not mourn. In his sermon, entitled, “Carriers of Glory,” Adeboye said for anybody to carry God’s glory, he must be a true child of God and live a life of holiness. Meanwhile, one of Osinbajo’s aides, Babafemi Ojudu, who was on board the crashed helicopter, said they were lucky that the helicopter did not burst into flames. Ojudu, who took to his Facebook page to narrate his ordeal during the incident, added that the seat belts helped them while their ordeal lasted. He wrote, “To family, friends and associates, thank you all for your concern and show of love and affection. I can’t thank you enough. It was a miracle we survived. “The seat belts did a marvelous job and so were the security men on the ground, who quickly pulled us out of the wreckage not minding their own safety. We were also calm all through the ordeal. There was no panic of any kind. “The immediate concern of all of us was the safety of our principal (Osinbajo). We ensured he got out first. He too ensured we were all out before going into a vehicle. When we were all safely in the bus he insisted the assignment must go on and we drove to the palace of the Obaro of Kabba. Also, President Muhammadu Buhari has commended Osinbajo for his “resilience” over how he handled the helicopter crash. According to a statement from Garba Shehu, the presidential spokesman, Buhari called the Vice-President on phone and praised him for continuing with campaign activities despite the crash. This was contained in a statement signed by the Director of Public Relations and Information Nigerian Air Force, Air Commodore Ibikunle Daramola, in Abuja, on Sunday. Daramola said, “NAF wishes to state categorically that the helicopter that crashed in Kabba does not belong to NAF or 011 PAF. The owners/operators of the civilian helicopter, Messrs Caverton Helicopters, have already issued a statement on the matter. Meanwhile, the leadership of the Christian Association of Nigeria on Sunday felicitated with Osinbajo for surviving the helicopter crash. The CAN President, Rev. Samson Ayokunle, in a statement in Abuja issued by his Special Assistant, Media and Communications, Pastor Adebayo Oladeji, also appreciated God for Osinbajo’s safety. “The leadership of CAN is grateful to God and rejoices with the Federal Government and Osinbajo. We give glory to God for sparing the life of the Vice-President and his team from the helicopter crash while mobilising support for his party in preparations for the coming general elections,” he said. The cleric recalled that the Vice-President had a similar experience in 2018 while visiting the Nigeria Customs College in Gwagwalada, Abuja. Ayokunle urged the technical team or those responsible for the certification of the aircraft and helicopters in the country used by government’s officials to be more meticulous so as to avoid putting their lives in danger. Meanwhile, the Delta State Governor, Ifeanyi Okowa and the Ooni of Ife, Oba Adeyeye Ogunwusi, have rejoiced with the Vice-President and others for surviving the helicopter crash . The governor called on relevant stakeholders to ensure adequate maintenance and global best practices in the aviation sector to prevent deaths occasioned by such negative occurrences. The Ife monarch in a statement signed by Director, Media and Public Affairs, Ooni’s Palace, Mr Moses Olafare, on Sunday, glorified God for saving Osinbajo and his aides who were involved in the crash. Oba Ogunwusi said he rejoiced with all the survivors, their families, the government and Nigerians over the rescue of the Vice-President and his aides. He urged all the politicians to remain unshaken by the incident, adding that they should continue with their electioneering ahead of the February 16 and March 2 general elections. However, the presidential candidate of the Accord Party, Isaac Ositelu, on Sunday asked the Federal Government to explain to Nigerians why Osinbajo had to use a hired helicopter instead of flying one of the choppers in the presidential fleet. He also said the circumstances surrounding the crash must be probed and its outcome made public in order to ensure that there was no repeat of such accident. Ositelu also expressed worry over what he described as the chaotic scene of the crash site.